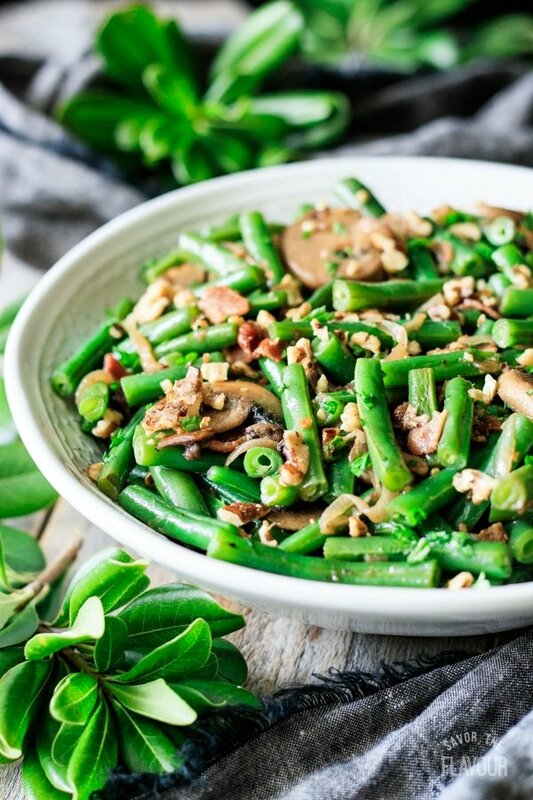 This recipe for healthy green beans with bacon and mushrooms is made totally from scratch. 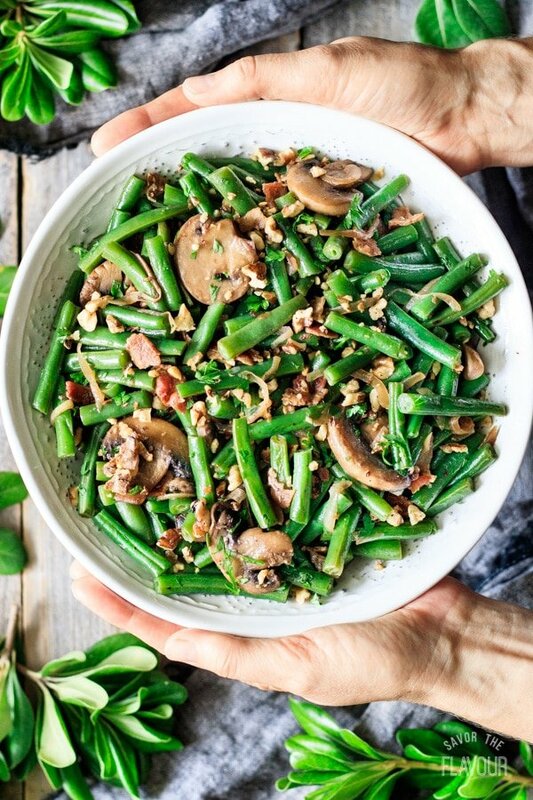 Fresh green beans, olive oil, mushrooms, shallots, and bacon come together to make this delicious low carb Thanksgiving side dish. You’ll be proud to serve this to your family! This post was originally published on September 27, 2017. Looking for a healthier way to serve green beans for Thanksgiving? Forget the traditional green bean casserole and serve green beans with crumbled bacon, toasted walnuts, sauteed mushrooms, shallots, and a sprinkle of fresh parsley. 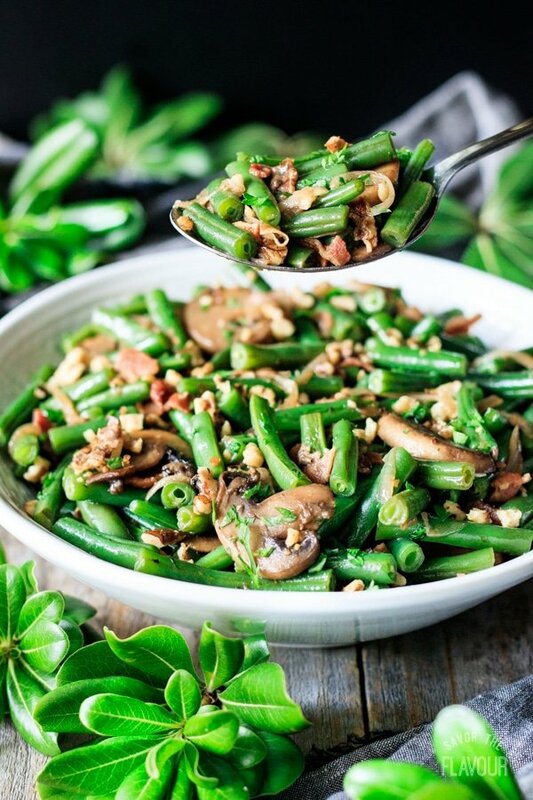 Keep reading to find out how to make these healthy green beans with bacon and mushrooms. High in vitamins A, C, and K.
Packed with fiber to help your stomach working properly. Helps meet your daily folate needs to ward off depression. Helps with bone regeneration, as they’re a great source of silicon. How do you blanch green beans? Bring salted water to a rolling boil. 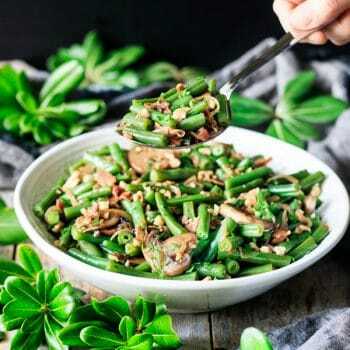 Submerge the green beans and cook until tender. Shock the beans in an ice water bath to stop the cooking process, then drain. Gather all the ingredients. 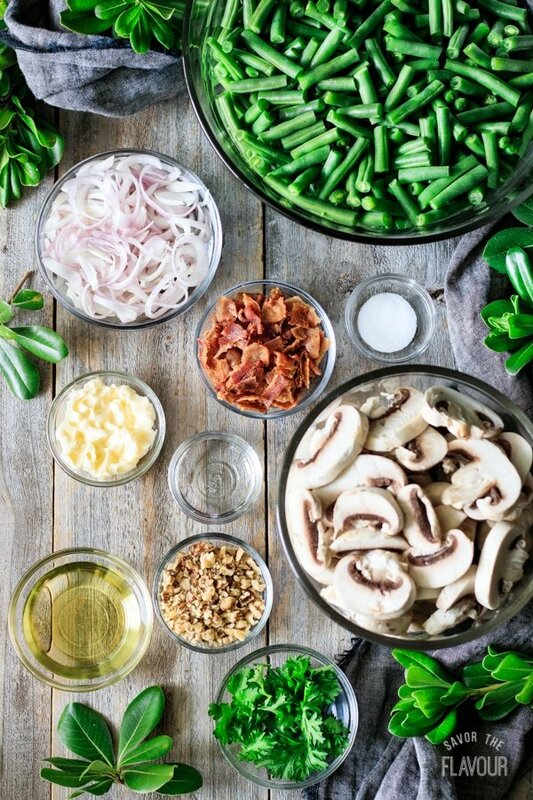 Rinse and cut the green beans, slice the shallots into rings, cook and crumble the bacon, and slice the mushrooms. 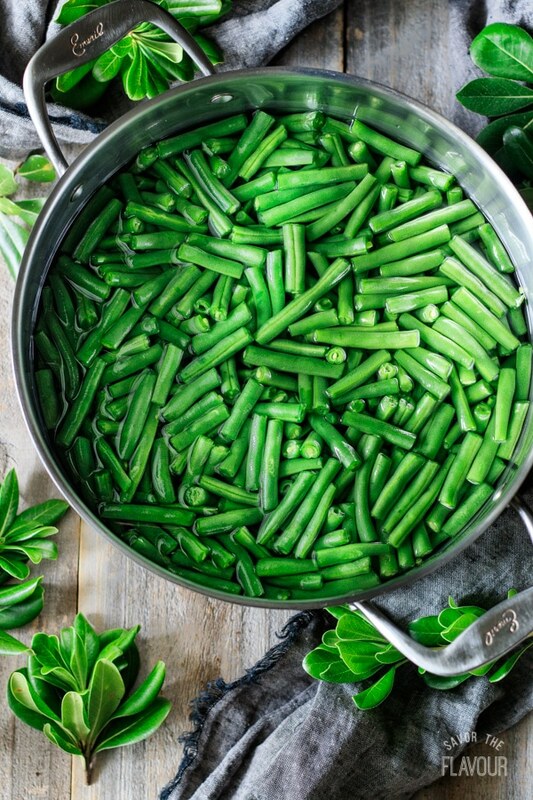 Bring a large pot of salted water to a boil, submerge the green beans, cook until tender, than drain. 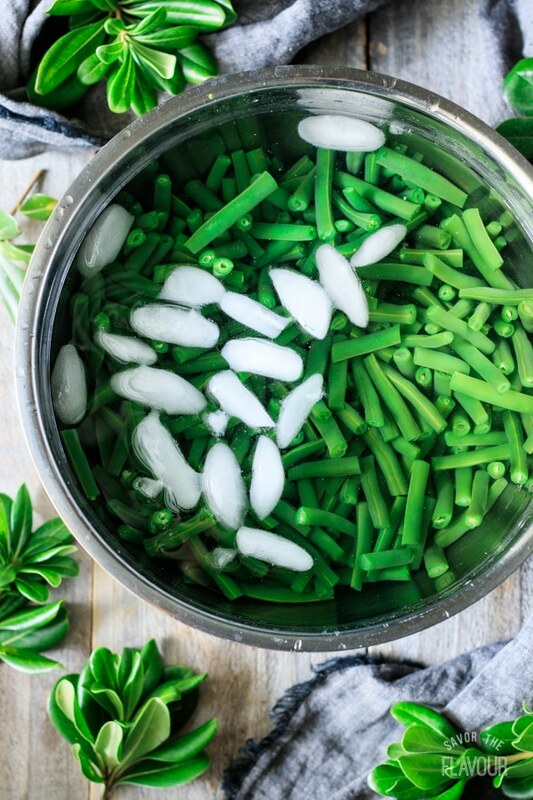 Shock the green beans in an ice water bath for a few minutes. Saute the sliced mushrooms in butter over medium high heat until they are a nice shade of brown and the liquid has evaporated. Remove the mushrooms, add more butter, and saute the shallots. 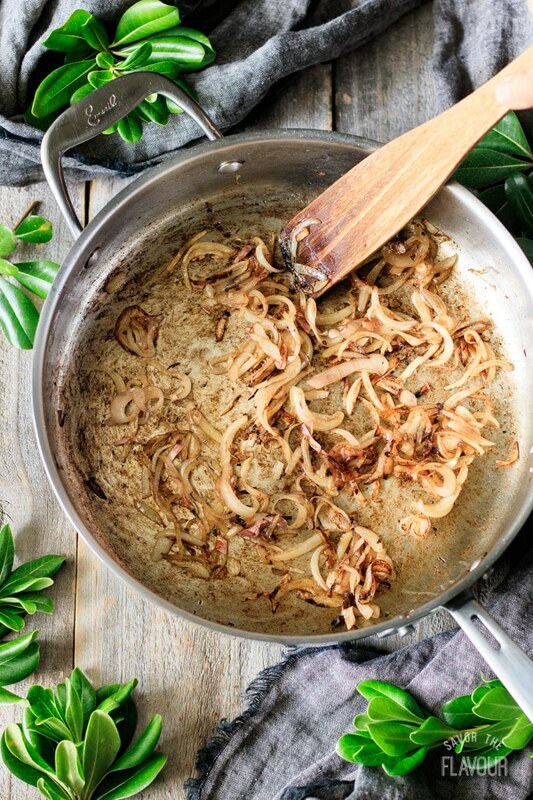 Remove the shallots and pour in 1/4 cup white wine to deglaze the pan. Scrape off the bits of mushrooms and shallots. 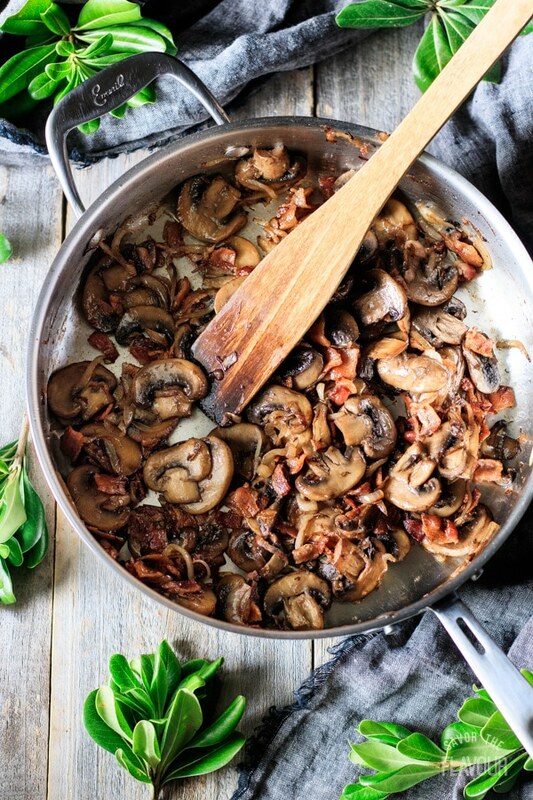 Return the mushrooms, bacon, and shallots to the skillet. Stir to mix, then reduce the heat to medium low. 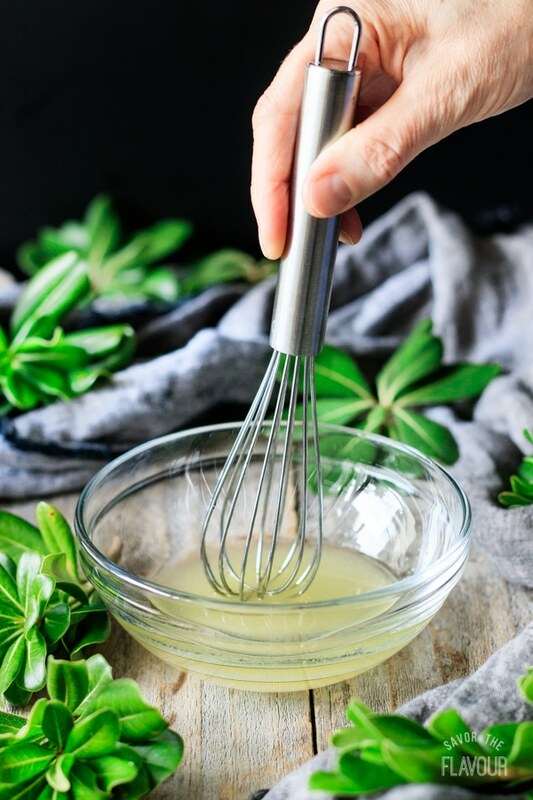 Whisk together the olive oil, sugar, and salt in a small bowl. Toast the walnuts in a dry skillet over medium high heat. 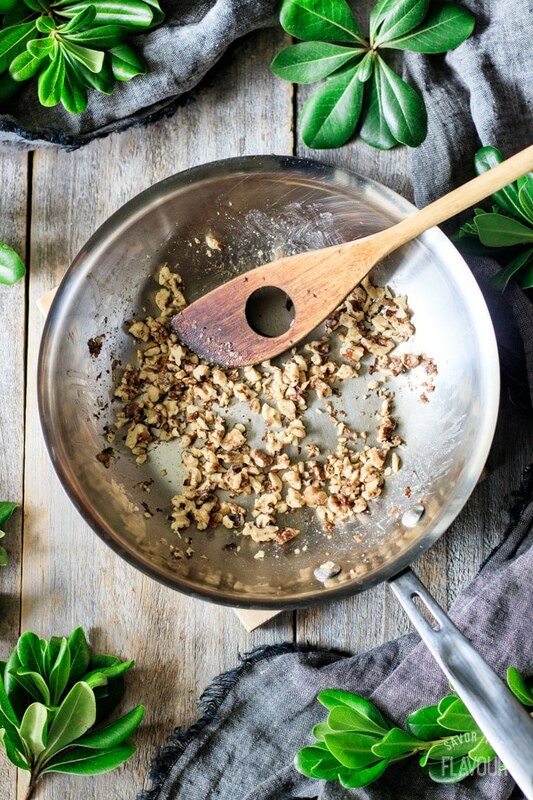 Stir constantly for a few minutes until the walnuts are fragrant and they start to darken. Add the green beans to the skillet. Turn up the heat to medium high for a few minutes, and stir until they are heated through. Remove from the heat and stir in the dressing. Garnish with fresh parsley, toasted walnuts, and crumbled bacon. Serve warm. This recipe is low carb and is made completely from scratch. Impress your friends and family members this Thanksgiving with this amazing, healthy side dish. Maintain your clean eating goals with these other healthy Thanksgiving side dishes. 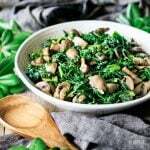 Sautéed Kale with Mushrooms: get tons of healthy nutrients in this quick and easy side dish. 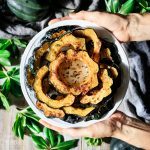 How to Cook Acorn Squash: it’s super easy and tasty to roast this nutritious vegetable. Roasted Sweet Potato, Wild Rice, and Apple Salad: a beautiful, healthy salad with lots of color. 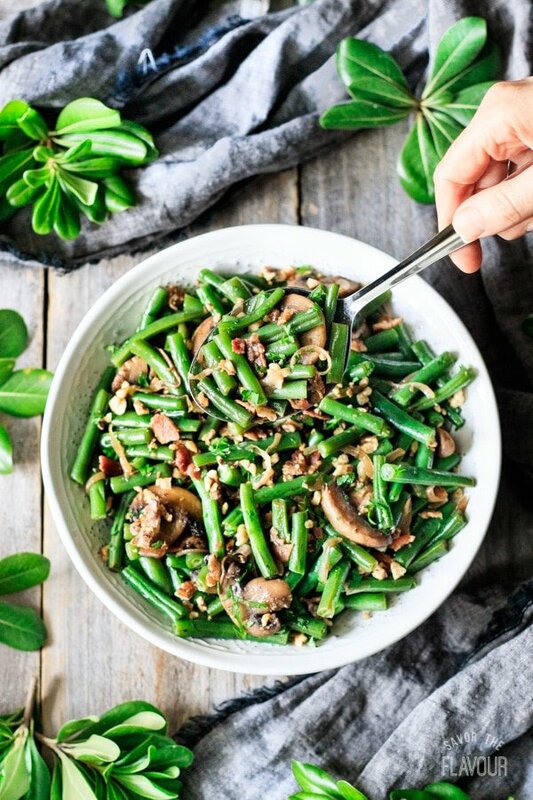 Did you make these healthy green beans with bacon and mushrooms? Please leave a recipe rating below to share your thoughts! Top and tail the green beans and cut them into 2-inch lengths. Bring a large pot of salted water to a boil. Submerge the green beans and cook for 8 minutes or until tender. Drain, then shock in an ice water bath for a few minutes. Drain again. Cook the bacon in a skillet, flipping it with a fork. Drain it on paper towels until cooled, then crumble it into bite-sized pieces. Melt 2 tablespoons of butter in a large skillet over medium-high heat. Fry the mushrooms until they have turned brown and all the liquid is gone. Remove the mushrooms, add more butter, and cook the shallots until golden. Remove the shallots, then pour in 1/4 cup of white wine to deglaze the pan. Scrape off the browned bits of mushrooms and shallots. Return the mushroom, bacon, shallots, and green beans to the skillet. Turn heat down to medium low to heat through. 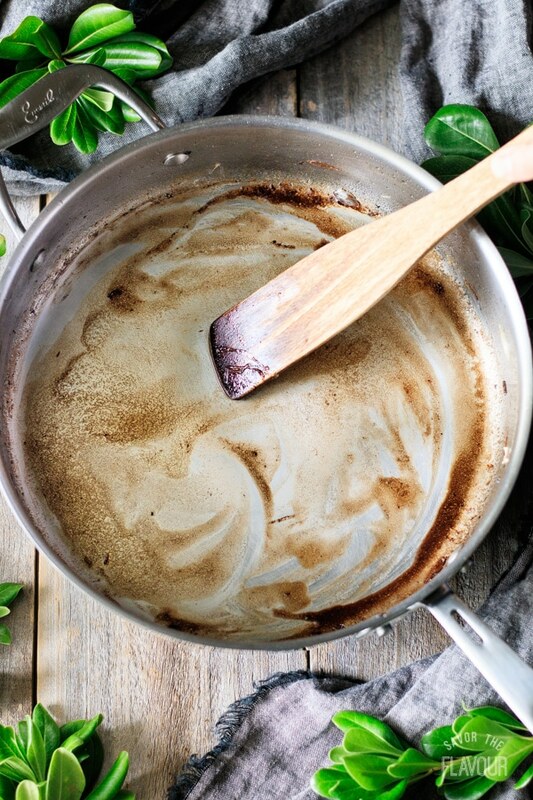 Meanwhile, whisk the oil, vinegar, and salt together in a bowl. Once the green beans are heated through, remove from the heat and pour the dressing over the beans and toss to combine. Chop the walnuts and toast them in a small skillet over medium-high heat, stirring constantly. Watch them closely, as they burn easily. Rinse and chop the flatleaf parsley. Add walnuts to the green beans and toss again, then garnish with chopped parsley. Serve warm. 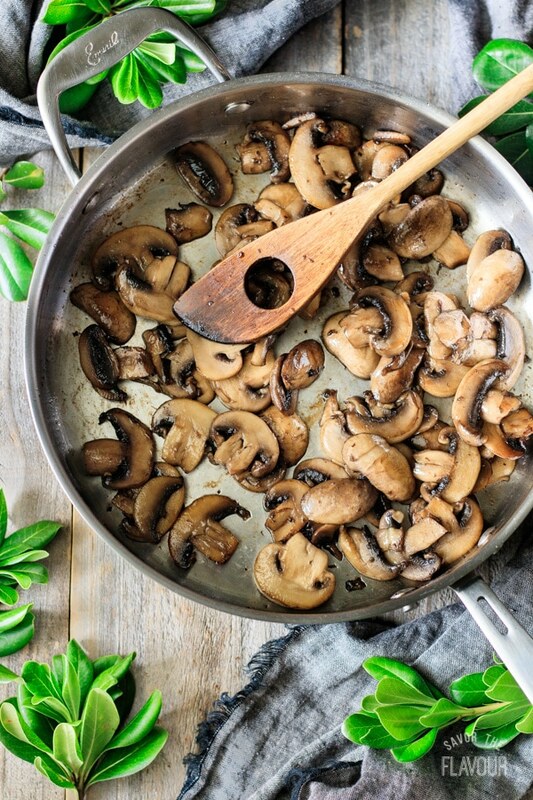 Keep the mushrooms large if you have picky eaters in your family. 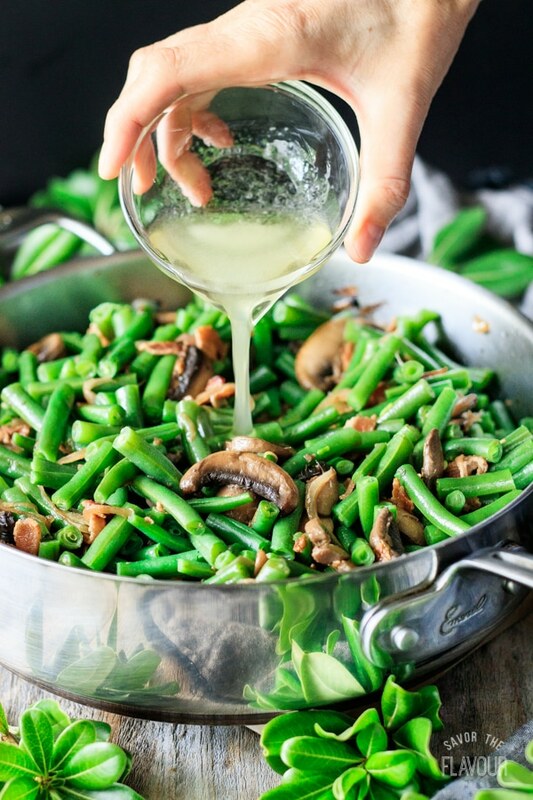 You can also top the green beans with shaved Parmigiano-Reggiano cheese for extra flavor.